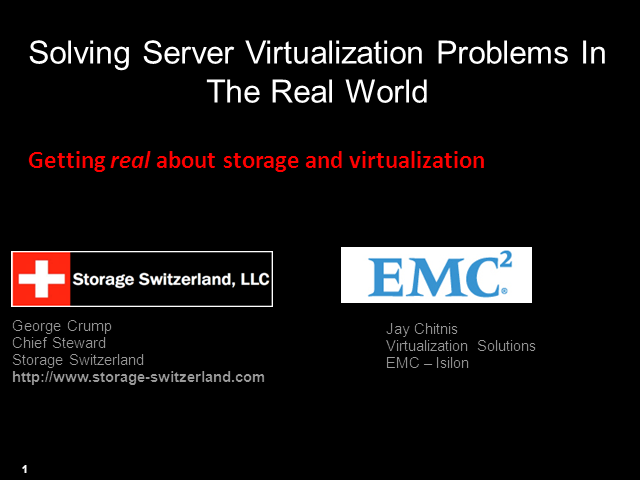 Join Storage Switzerland and EMC Isilon for this unique seminar that will look at solving the storage obstacles created by server virtualization from the perspective of the storage administrators that have conquered these daunting challenges. First Storage Switzerland will provide perspective based on interviews with storage managers responsible for varying sized data centers. We will cover what challenges they faced initially and as the virtual environment grew. Then we will discuss the attempted work arounds that these IT professionals attempted to solve the problem. Finally we will cover the solutions that fixed their problems and how you might apply these solutions to your storage and virtual server environment. We will end with EMC Isilon discussing how their OneFS file-system and scale-out storage hardware is an ideal storage platform for the virtual environment.